The trailhead at Stevens Twin Sinks. 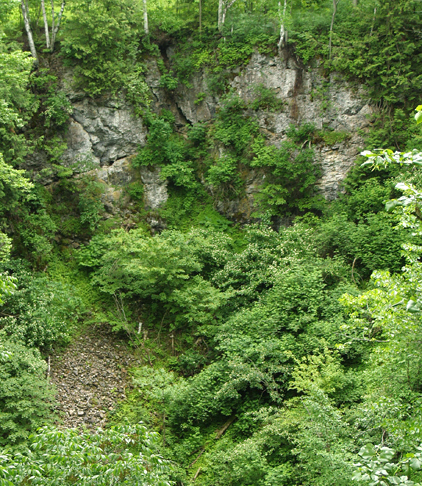 A foot trail passes along a narrow saddle ridge between the steep walls of the sinkholes at Stevens Twin Sinks. 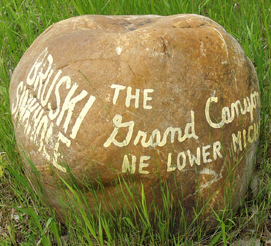 When driving to Stevens Twin and Bruski sinks, keep an eye out for the painted mini-boulder at the entrance to Bruski. The south wall of Bruski Sink. 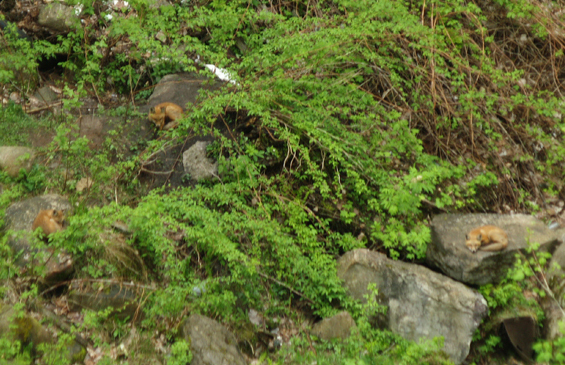 Three red foxes spotted in Bruski Sink in 2011. Stevens Twins Sinks and Bruski Sink are units of the Thunday Bay Karst Preserve, along with Mystery Valley. 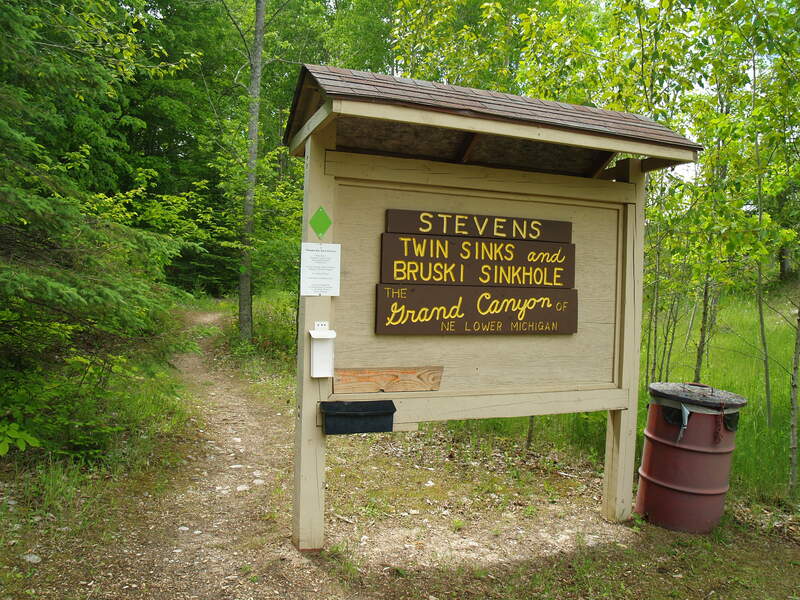 The Stevens Twin Sinks unit is a 31-acre parcel purchased in 1993 with gifts from William and Archie Stevens and other members and friends of the MKC. In it are two sinkholes separated by a fragile saddle ridge, each about 200 feet in diameter and 85 feet deep. The 2.5-acre Bruski Sink unit across Leer Road was donated to the Conservancy in 1996 and made part of the Thunder Bay preserve. Though there are more than 200 sinkholes in Michigan’s northern lower peninsula, most are located on private property. Only the sinks that make up Thunder Bay Karst Preserve and Shoepac Lake State Forest Campground to the west are available for public access. The MKC restricts access to the Stevens Twin and Bruski sinks to protect their thin soil cover, as well as for safety reasons. Visitors can follow walking trails that offer views of the sinkholes and a nature trail near the Stevens Twin Sinks. MKC volunteers mow the trails monthly during spring and summer. A spur on Sinkhole Trail leads to earth cracks which indicate the sink continues to slowly collapse and widen. Nature Trail branches off and returns to Sinkhole Trail after meandering through a beech grove. Another short trail follows the south and east walls of Bruski Sink. Bruski Sink was used illegally as a trash dump for many years. In 1999, the MKC began cleaning trash from the sink with a 75-ton crane from Moran Iron Works. Over several years, MKC volunteers removed eight car bodies, refrigerators, washers, dryers and coils of wire fencing. They also removed dozens of rusting containers of insecticides, motor oil, paint thinners and other chemicals which could have polluted groundwater. The sinkhole grew in depth from 75 feet before the cleanups to 112 feet afterward. Along with sinkholes, an earth crack in the northeast corner of the Stevens unit is more than 150 feet long. Such cracks are caused by “slumping” of rock as the layers beneath erode away. The hummocky terrain in the Stevens unit and to the east results from large rock blocks collapsing and settling, and often shattering in the process. The most notable biological feature is the microclimates created at the bottoms of the sinks. With less sunlight and wind, more moisture and cooler temperatures than at the surface, several species of plants that grow in the sinkholes - especially ferns - are not found in surrounding surface habitats, but rather several hundred miles to the north. The effect is heightened by the way cold air readily accumulates and persists at the sinkhole bottoms, and how they retain snow earlier in the fall and later in the spring. The forest is second growth, dominated by beech, maple and birch trees. An open glade in the southern part of the property may have been tilled at one time. Trees growing in the sinkholes provide unique viewing opportunities at tree-top level of the annual warbler migration occurring from mid to late May. Anyone descending into the sinkholes must wear a hard hat with a chin strap and sturdy boots, follow the path established by the Preserve Committee, and sign a liability release and a form acknowledging the preserve's use policies. *Add 3.0 miles to Mystery Valley entrance. From Alpena to Stevens Twin and Bruski sinks: At the intersection of US-23 and Long Rapids Road, drive west on Long Rapids 14 miles to M-65, then turn right (north) on M-65 and drive 0.4 miles. Veer left onto Leer Road as M-65 bends and drive north 4 miles. Stevens Twin Sinks are on the left and Bruski Sink is on the right. From Onaway and Rogers City to Stevens Twin and Bruski sinks: Drive east on M-68 to Rogers City. Take US-23 south to M-65; drive south about 14 miles to Maple Lane. Turn left (west) and follow Maple Lane to Leer Road. Turn left (south) and drive about 200 feet. Stevens Twin Sinks are on the right and Bruski is on the left. From Atlanta and Hillman to Stevens Twin and Bruski sinks: Drive east on M-32 to M-65 north; turn left and drive north on M-65 through Lachine and Long Rapids. Just north (0.4 miles) of Long Rapids, veer left onto Leer Road as M-65 bends. Drive north 4 miles on Leer Road. Stevens Twin Sinks are on the left and Bruski Sink is on the right. From Stevens Twin and Bruski sinks to Mystery Valley: Drive north on Leer Road to Olsen Road. Turn left (west) and drive to the intersection of Carr, Posen and Leer roads. Continue north on Leer for 0.4 miles and the gate to Mystery Valley is on the right (14888-14894 Leer Road). Note: Olsen Road is narrow and muddy in rainy weather. If you choose to follow Leer Road north past Olsen, turn left at the Leer Lutheran Church onto Leer/Carr Road. Follow Leer to the intersection with Posen and Carr roads and turn right. Follow Leer Road for 0.4 miles and the gate to Mystery Valley is on the right. Stevens Twin Sinks and Bruski Sink feature self-guided trails highlighting their natural features. These trails are not suitable for personal assistance mobility devices, as stated in the trail policies in each trail guide. 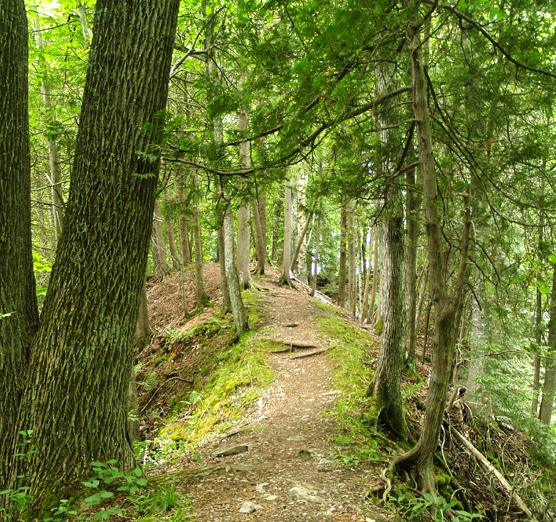 Download the Stevens Twin Sinks and Bruski Sink trail guide in .pdf format.